"Dog Stomach Problems and aches can have multiple causes including ulcers, blockages, tumors, bloat (gastric dilatation volvulus), Addison's disease and gastritis. Dogs can also exhibit vomiting and diarrhea as a reaction to a problem in the intestines, food allergy or food intolerance. The most common stomach related symptom is vomiting with or without diarrhea which should resolve itself within 24 to 48 hours. Be sure to differentiate vomiting (which is related to stomach problems, with regurgitation – see below for differences). Risk factors for stomach or abdominal problems include any dogs that take corticosteroids or anti-inflammatories (NSAIDs), eating garbage or other unusual foods (pancreatitis), eating a foreign body which causes an obstruction, injury to the abdomen and a hernia, which is a bulge in the wall of the abdomen. Note that if your dog licked antifreeze in the street, this is a poison and requires immediate treatment. Be sure to call your veterinarian immediately if your dog is under age 6 months, you see objects in the vomit such as plastic or worms, your dog swallowed an object, you see blood, you see the stomach getting larger, your dog has other health problems or if the vomiting is persistent for a period of 4 hours or longer." Within these organs, the body digests, absorbs nutrients, moves waste through the body and then eliminates it through liquids and stools. Dog stomach problems and related issues involve identifying where in the process things went wrong and then to seek the appropriate treatment for each underlying cause. Symptoms provide the best clue. For example, vomiting digested food (undigested food refers to regurgitation, see below) indicates some type of stomach inflammation such as gastroenteritis. The challenge becomes differentiating a simple stomach issue from something that requires an advanced treatment approach such as liver or kidney disease. If vomiting for less than 4 days and there are no other symptoms, then treatment is usually withholding food and water until the vomiting stops, and then water only for 24 hours. If other symptoms such as weakness, weight loss, drooling, or trouble walking, lack of energy, then consult with a veterinarian. Also if your dog vomits everyday for more than 4 days, then a detailed veterinary exam is needed. Other symptoms such as diarrhea usually indicate some type of bacterial infection, virus or parasites. Diarrhea color and consistency are important clues in reaching a diagnosis. As a rule of thumb, if your dog is in pain, or if there is blood in the vomit or diarrhea then contact the vet. Behavioral changes, aches, pain, or a distended abdomen also indicate that a veterinarian should be consulted. Note that an enlarged and/or painful abdomen is considered to be an emergency and requires immediate medical care. Treatment: Nothing by mouth until vomiting stops followed by sips of water and fluid therapy. Antiemetics such as Chlorpromazine used to stop vomiting. Stomach calmed with over-the-counter products such as Kaopectate and pepto-bismal. Prevention: If changing diet, make switch gradual, If vomiting 2 to 3 times, nothing by mouth for 24 hours. Watch dog like a hawk if prone to swallowing objects. For additional reading see dog gastritis. Canine inflammatory bowel disease (also called immune-mediated inflammatory bowel disease) happens when the stomach or intestines suffer from inflammation. It is caused by either eating table scraps or by a parasitic infection. Treatment: Treatment includes limiting food intake and eliminating the underlying cause. Medications are used to inhibit the immune system response (Cyclophosphamide). Sulfa drugs (Sulfasalazine) are used to address an inflammation, bacterial problems and colitis. Hypoallergenic diet with highly digestible proteins is recommended (chicken, duck, lamb, rabbit). Patient will need special diet and be monitored for life. For additional reading see canine IBD. Symptoms: Dogs can have no symptoms to vomiting mixed with blood. 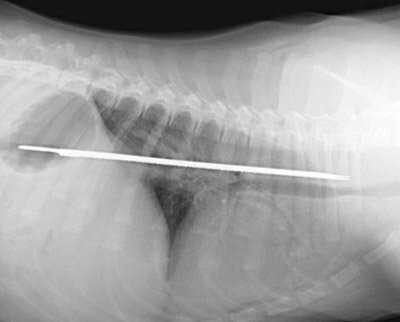 Dog may have abdominal pain. Blood poisoning can occur if ulcer causes any perforations in the stomach. 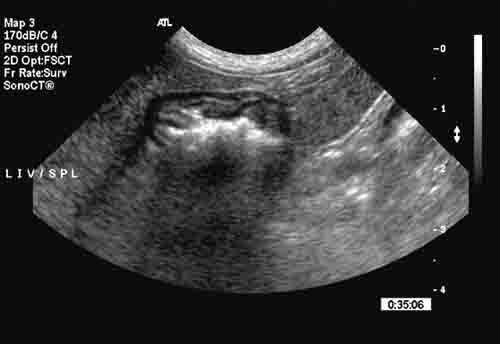 For additional reading see gastric ulcers in dogs. 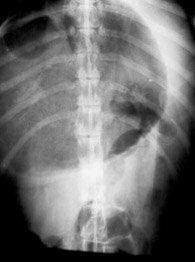 Diagnosis: X-rays to indicate air or gas filled stomach. Blood test to measure electrolyte levels, physical examination. Treatment: Decompress stomach with tube or surgery if needed. For additional reading see dog bloat. For additional reading see gastric neoplasia and tumors. Like people, your dog stomach problems can be due to motion sickness. Symptoms: Symptoms of dog motion sickness include excess salivation, yawning and vomiting. Young dogs that are not used to being in a moving car sometimes get motion sick. Once your dog gets used to the motion, they should be fine. Until then your veterinarian can prescribe common motion sickness drugs such as Dramamine. Treatment: Treatment is also similar to humans with the use of Dramamine (dimenhydrinate) and Gravol. The dosage for dogs is 2 to 4 mg for every pound of your dog's body weight every 8 hours. Give your dog the mediation 1 hour prior to traveling. Never give your dog an over the counter medication without consulting your veterinarian. Canine Addison’s Disease is a dog stomach problem that impacts your dog's adrenal glands. These are the glands that sit on top of the kidneys and are located in the abdomen. The glands secrete hormones that help the body regulate itself. The disease occurs when the body's own immune system attacks the glands and causes them to shut down. When a dog collapses with no known cause, canine Addison's disease is usually suspected. Adrenal glands excrete hormones that help the body function. This is not a stomach problem, but the symptoms are similar, such as diarrhea and vomiting. Addison’s can be triggered by other illnesses and toxins that destroy the adrenal glands (toxic medications, tumors, infections). The glands can also be damage by an autoimmune reaction or in dogs that take corticosteroids (side effect of steroids). Diagnosis is made with a ACTH stimulation test. Treatment includes the use of corticosteroids and intravenous fluids. Prescription medications such as Florinef and Percorten can treat this condition along with intravenous fluids. Chronic cases are treated with oral cortisone. Dogs respond well to this approach and require treatment for the rest of their life. For additional reading see Addison's Disease in dogs. Treatment involves removing the object causing the problem. Signs are diarrhea that is often mixed with blood. Accompanied by depression and appetite loss. caused by diet change, medications or stress, provide nothing by mouth for 24 hours, water is ok if any vomiting has stopped. Caused by parasites or protozoa (giardia, Coccidia). Treatment requires medications such as Anthelmintics (parasites) or antiprotozoal medications. The key to understanding these issues is the severity of the symptoms and how long they last. If the stomach is the problem, then the most common symptom is vomiting. If the problem is due to inflammation in the digestive tract then vomiting is often accompanied by diarrhea, weight loss, appetite loss, avoidance of eating (anorexia). The most common symptoms of a dog stomach problem is vomiting. It is important to distinguish between regurgitation and vomiting. In regurgitation food that enters your dog is rejected before it enters the stomach. It is due to an issue with the esophagus, which is the tube that leads from the mouth into the stomach. Regurgitation happens when there is something blocking the esophagus such as something your dog has eaten. Another accompanying symptom is drooling. A partial blockage will result in a persistent problem. Vomiting is when the contents of your dog’s stomach is expelled by the body. It usually has a bad smell and looks like it contains food that hasn't been digested all of the way. Stomach problems are related to vomiting. Other illnesses related to dog vomiting includes diabetes mellitus, kidney disease, liver disease or a problem with your dog's electrolytes (the sales and minerals that help the body conduct electrical impulses). If your canine has persistent dog stomach problems and medical causes have been ruled out (see following pages), one option is to try a remedy formulated to strengthen the dog's dietary system. When your dog isn't eating right, or not getting the right foods/ingredients it could result in digestive imbalance. In the wild dog's naturally can select those things that are required to balance the diet. Household pets rely on pet parents. Althaea officinalis (marshmallow): soothes the mucous membranes and the digestive tract lining. One product worth researching and discussing with your veterinarian for dog stomach problems is called Digestive Support. Discuss this and other options with your veterinarian so that he or she can track your dog's progress. As long as you are feeding your dog a reputable commercial brand that is AAFCO certified. then you should be providing the necessary nutrients for dog stomach health. The biggest difference between types is the amount of water in the food, which isn't an issue if your dog is drinking properly. Dry dog foods tend to cost less and are fine for most dogs. If you believe diet is a problem your veterinarian can recommend a Prescription Diet that limits certain parts of the diet.